It’s an exciting time at Dallas Market Center. 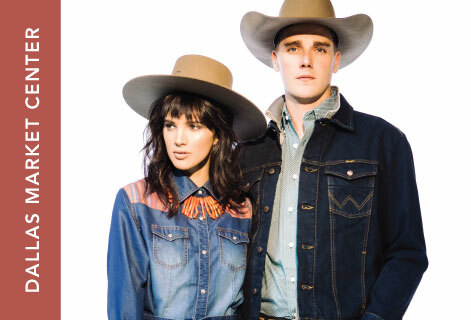 With anticipation building for the launch of WESA’s International Western/English Apparel & Equipment Markets in Dallas in 2021, hardly a week passes without the announcement of new and expanded resources for buyers seeking western and western-inspired products. Allens Boots, Ariat, Barbosa Collection, Bohemian Cowgirl, Cactus Ropes/Cactus Gear, Clint Orms, Collins of Texas, Corral Boot Company, Crazy Train, Dan Post Boot Company, Double D Ranchwear, Double J Saddlery, Equibrand Products Group, Ferrini, Grace in LA, HatCo (Charlie 1 Horse, Dobbs, Double R by Resistol, Resistol, Resistol Apparel, Sherry Cervi by Resistol, Stetson), Hooey, J. America (John Deere Sportswear/Wrangler Headwear), Justin Brands, Lane Boots, Leegin Leather (Belts by Tony Lama, Justin, Chippewa), Lucchese, M&F Western Products, Montana Silversmiths, Morris Kaye & Son Furs, Old Gringo/Craig Davison, Outback Trading Company, Pat Dahnke, Professionals Choice, Rios of Mercedes Boot Co. (Anderson Bean, Macie Bean, Miss Macie, Horsepower, Olathe), Sam DeVault, Scully, Sidran (Cripple Creek, Circle S, Cowboy Up, Cowgirl Up), Southern Grace, STS Ranchwear, Tasha Polizzi, Trenditions, Twisted X, Vogt Silversmiths, West & Co, Westmoor Manufacturing (Panhandle, Rock and Roll Denim, Rock and Roll Cowgirl), Wrangler, and XOXO Art & Co. Check our newsroom for announcements as we continue to welcome new friends to market. We are also adding new product categories including tack, farm and ranch products and equipment, workwear and safety wear to create the largest Western product marketplace in the world. All this, as our facility announces exciting updates to enhance the market experience for buyers and exhibitors alike. We’ve debuted dozens of new showrooms in apparel and accessories, gift and home, and we recently cut the ribbon on a new full-service Starbucks. In addition, last month we launched the world’s largest private 5G LTE cell network and enhanced WiFi to boost digital connectivity throughout our campus. Through it all, we remain committed to the power of a firm handshake and person-to-person relationships. As we prepare to welcome WESA, this philosophy will continue to guide the evolution of Dallas Market Center.